What a month that we have had. Not only was Mother Nature not nice to many of the racers, fans and race tracks across the state but, there has been some great losses this past month also. 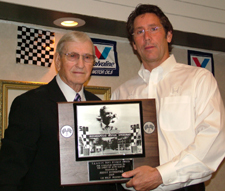 With the loss of the best leader NASCAR had in Bill France Jr. to the loss of club member Buck Harson’s father who pass away last month. We are also saddened of the news that Clyde and Hermina Wright both passed away with in the last few months. They were long time supporters and members of our club and we will miss them dearly. May God be with all the families at this sad time! We have also learned of the passing of NHRA Top Fuel Driver Doug Kalitta’s father Douglas F. Kalitta this past week. He was the proprietor of Doug’s Welding Supply in Chesterfield Township for 45 years. Doug was a friend to many in the Mt. Clemens area and was also the brother to legendary drag racer and owner Connie Kalitta. Our thoughts and prayers are with the entire Kalitta family. I am a charter member of MARFC, and back in time I was called on to return, to lead the club again. The club was very short on funds and there was not enough to send out a newsletter at the time. The out going President gave me a copy machine, ink, and an old movie projector and a hand full of stamps which was not enough for a newsletter mailing. At the time postage had just went up in price from .25 cents to .29 cents so I used them “Wisely”. I send out letters begging for items to have an auction. I was working at the Michigan International Speedway at that time, and Darwin Doll was the track President then. He told me that they were holding a flea market and auction two day event in two weeks and he would wave the fee to enter the auction for the club. A good friend Dennis Castelle who more than once was the master of ceremonies at our fan club banquets agreed to be our auctioneer and what a job he did. Stay tuned to read part two about the auction in the August newsletter. 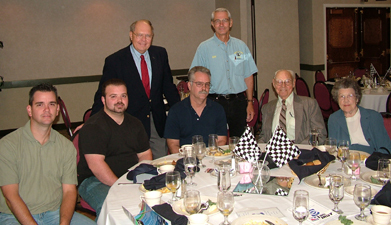 NAARFC CONVENTION: We had 19 members attend the annual convention breakfast this year and they were treated to seeing two new members inducted into the Nationals hall of fame and they were Rick Mears and Stan Fox. Tony Hullman George was on hand to present a letter of commendation to President Lee Holst for his 47 plus years of service as President of the National. Great job Lee! Another great evening for racing was had by the fans at Toledo. Our MARFC Uniform/Helmet Bag was given to sportsman driver # 78 Andy Harding for outstanding rookie of the season so far and nearly in the top ten in points already. Many Thanks to Ron Drager, Roy Mott and the staff at the speedway for a great evening. FLAT ROCK SPEEDWAY: Mother Nature pulled a fast one on us from hot and sunny to a severe thunderstorm to cancel our MARFC night at the speedway. Thank you to Scott Schultz and staff for rescheduling this event for July 21, 2007. Great night weather wise for racers and fans! Our first trip to the dirt for 2007 was outstanding. 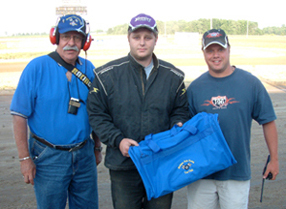 Terry Sroufe the 2006 Late Model Champion from Huntington, IN received our bag and Doug Jakeway, Larry Iacoboni & I were manning our MARFC at the table for the evening. Thanks Ralph & Ryan Warning and all the gang at Butler for the invite again this season. Once again another outstanding night with Mother Nature finally giving us the sun. Our trip to the speedway was an exciting one with lots of action. 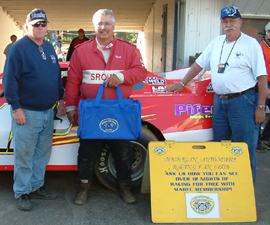 The MARFC Uniform/Helmet Bag went to late model # 27 Torch Osterhouse. Once again thank you to the Warning’s for a great time and look forward to next season. Not too hot just right for some fantastic dirt track racing. 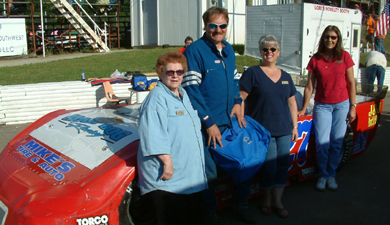 Jason Smith driver of modified # 71 was the winner of our MARFC Uniform/Helmet Bag by venture of the luck of the draw at the drivers meeting. To Mike Mouch and staff we say Thank you for having us again this year and can’t wait until next year’s event. Great to see many of our members stop by to say Hi. CRYSTAL MOTOR SPEEDWAY: By Dave DeHem: Bright & cooler weather on hand for some awesome dirt track racing. The MARFC Uniform/Helmet ban was presented to Modified # 4s driver Toby Steele. Toby’s granddaughter had cancer a year ago and Toby spent countless hours at the hospital where he became a grandfather to many of the kid’s with cancer. He took them many pictures of race cars and just plain made a huge difference for these kids and their families. The track recognized him for his selflessness and commitment to others before himself. His Granddaughter is doing just fine now and Toby is well respected and very humble as he didn’t do any of this for himself but for the good of others. To Ron Flinn and Roger Williams many thanks for making our day fun and exciting.